The display is one of the most important aspects of a smartphone, as it is the part of the device that the user will interact with most. We've seen tremendous improvement in smartphone displays as they have become more and more commonplace within society. The first area of improvement was resolution, which made sense with text being a necessary part of essentially every smartphone application. As displays have gotten to the point where there is little benefit to further increasing pixel density, we have also seen a push for greater color accuracy and image rendition. On the Android side of the market, Google was one of the first companies to start taking color accuracy seriously, and the Nexus 7 and Nexus 5 had some of the best calibrated displays of all Android devices. The Nexus 6 sports a 5.96" AMOLED display with a resolution of 2560x1440. 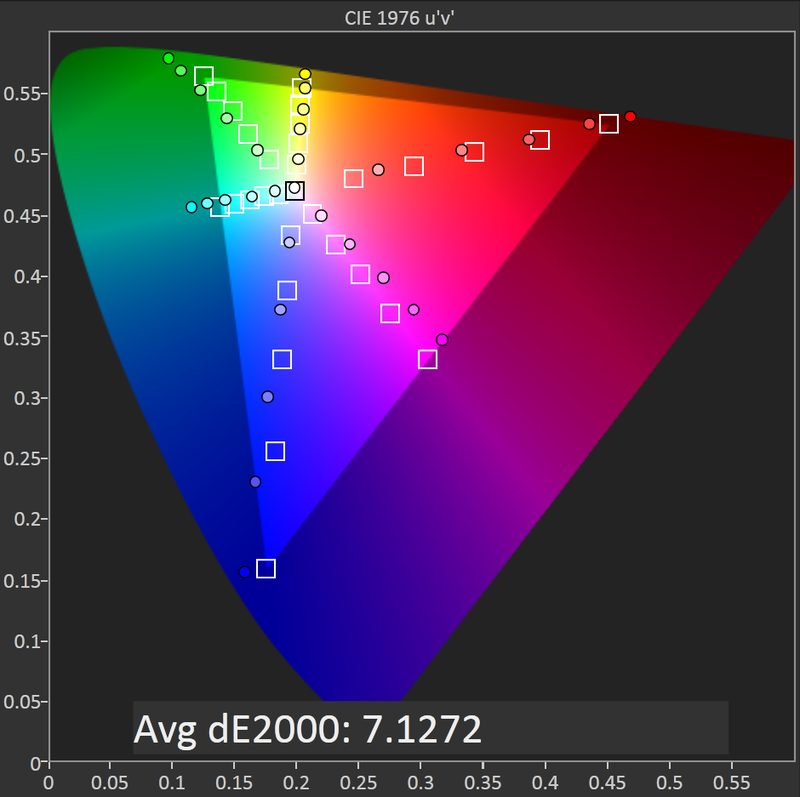 Given Google's work to provide accurate color calibration on the Nexus 5, and the massive improvements that we've seen in the calibration of AMOLED displays over the course the past year, I was very excited to take a look at the display on the Nexus 6. However, as someone who typically uses the very well calibrated iPhone 6 and Nexus 5 in daily use, I immediately noticed that the Nexus 6 produced a punchier image than I was used to seeing in the applications I use frequently. To take a look at the characteristics of the Nexus 6's display we turn to SpectraCal's CalMAN 5 software and an X-Rite i1 Pro 2 spectrophotometer for accurate measurements of the display's color. As always, we target the sRGB gamut which is currently the standard for photos on the web and video content. Contrast and black levels on the Nexus 6 are as incredible as ever. Brightness is definitely on the low side though. Testing was performed with both the manual brightness settings, and with Adaptive Brightness enabled and a bright LED aimed at the light sensor. In both cases the maximum brightness was the same, there's no higher brightness exposed when using the automatic brightness settings like there is for the Galaxy Note 4. What's interesting to note is that the brightness is similar to that of the 2014 Moto X, another recently released Motorola device that sports an AMOLED panel. However, even Moto X has an auto boost mode which pushes it up to 390nits. The overall similarity between the panel in the Moto X and the panel in the Nexus 6 persists throughout our other tests. 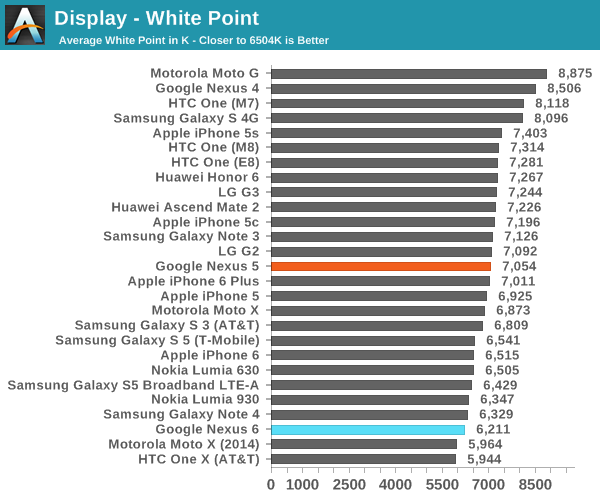 The Nexus 6 is slightly more red than our target for white point, though not to the extent of the 2014 Moto X. This contrasts with the IPS panel in the Nexus 5 which was too blue. In the greyscale we see that the luminance is comprised more of red and green than of blue. This translates to greyscale performance that is nothing exceptional, but not noticably worse than the Nexus 5, and still significantly improved compared to AMOLED panels from not long ago like the display in the Galaxy Note 3. In our saturation sweep test, the Nexus 6 performs rather poorly. Unlike Samsung's phones which have several display modes with one of them targeting sRGB, the Nexus 6 has only one display setting and it significantly overshoots the sRGB gamut. This does a good job at creating showroom appeal but is not helpful in accurately displaying the color in photos and videos. 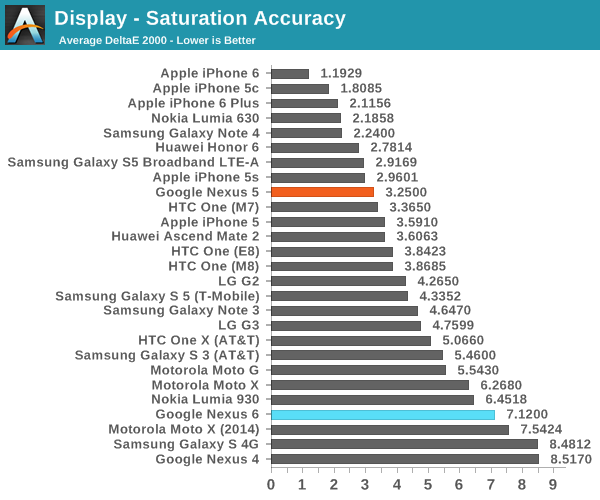 This is especially disappointing because the Nexus 5 was well calibrated to sRGB and performed much better in this test. The poor performance in the saturation sweep translates to equally poor performance on the ColorChecker test. The expanded gamut and saturation compression makes it effectively impossible for this display to render any sRGB content accurately. The greyscale performance helps to bring down the overall average, but the large errors with color mixtures prevent any sort of accurate image rendition. I was highly disappointed by these results. 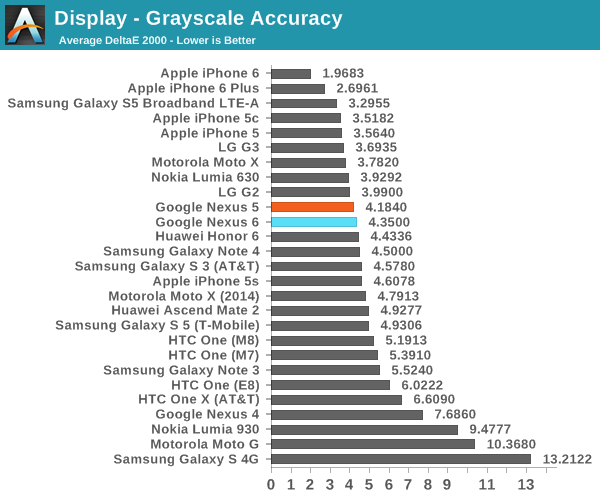 Like I said earlier, we've seen great improvements in the quality of AMOLED displays as of late, and Google took color calibration very seriously with the Nexus 5. 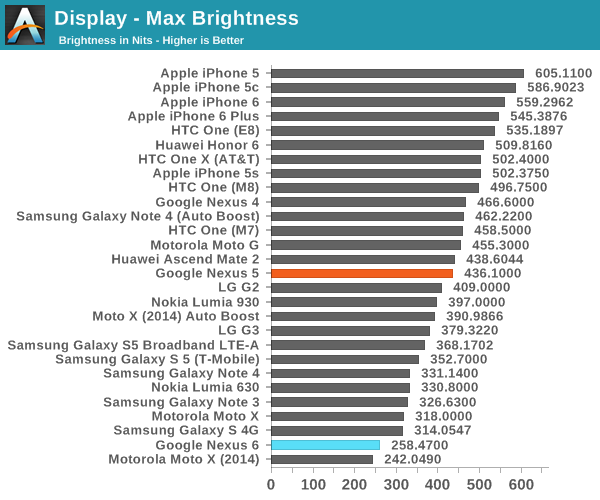 The Nexus 6 shows significant regression in color accuracy from the Nexus 5, and the maximum brightness is much lower. It should also be noted that despite its higher resolution, its larger size means that compared to the Nexus 5 the pixel density only increases 12% from 441 PPI to 493 PPI. The use of a PenTile RGBG subpixel layout also means that there is actually an overall decrease in subpixel density. Overall, the Nexus 6 display is quite poor relative to the displays on other smartphones like the Galaxy Note 4, iPhone 6, and HTC One (M7). It's also a definite regression from the display on the Nexus 5, which is concerning given the fact that the Nexus 6 is $300 more expensive. It has been speculated that Motorola is unable to source the latest generation of panels from Samsung Display, which would explain why many of the panel characteristics are similar to previous generation AMOLED panels in the Note 3 and Galaxy S4. Although the efficiency of AMOLED displays when displaying black helps to reduce power usage with features like Ambient Display which wakes up the phone when notifications arrive or it is picked up, I don't believe it's worth the trade-off if it involves such heavy sacrifices in color accuracy and brightness. In come the Nexus apologists that say this is a developer's phone!